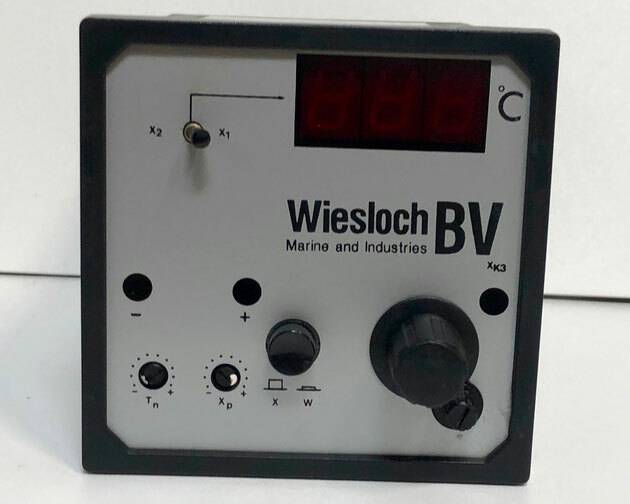 If you would like to receive an offer for a Wiesloch or Aalborg electric controller or another item, then please email directly at sales@shipspares.nl or use the "REQUEST A QUOTATION" - FORM. 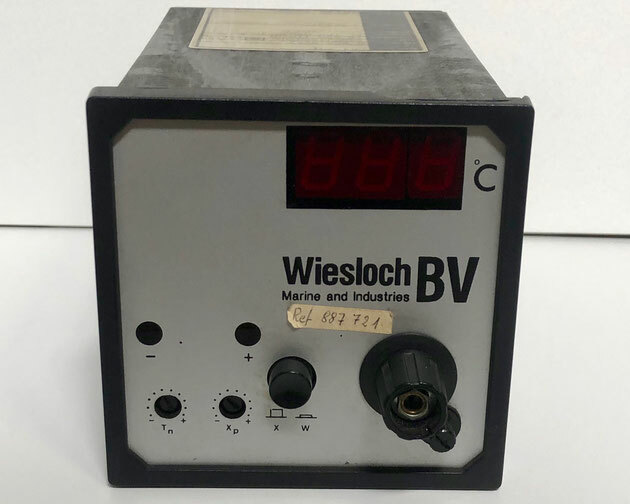 The Wiesloch electric controller Type 887723, Fb. Nr. : R9012174. This electric controller works on 220V-462Hz and 0,1A. The X-input is DIN/0…400℃, the Y-input is FG200 ohm/0…100% and the W-input is 0…350℃. 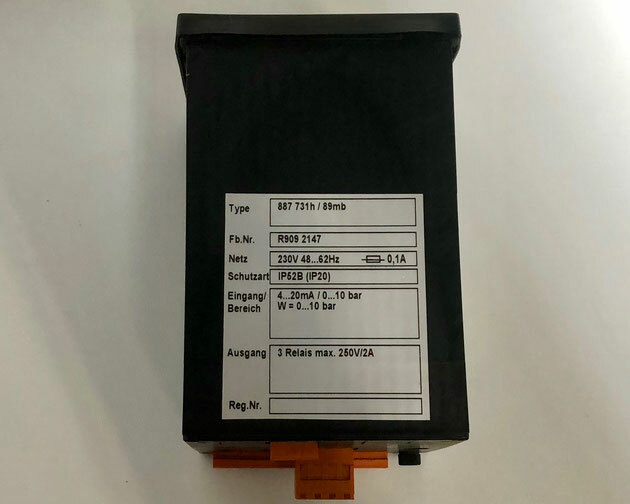 The output is 2 relais with max 250V 2A. 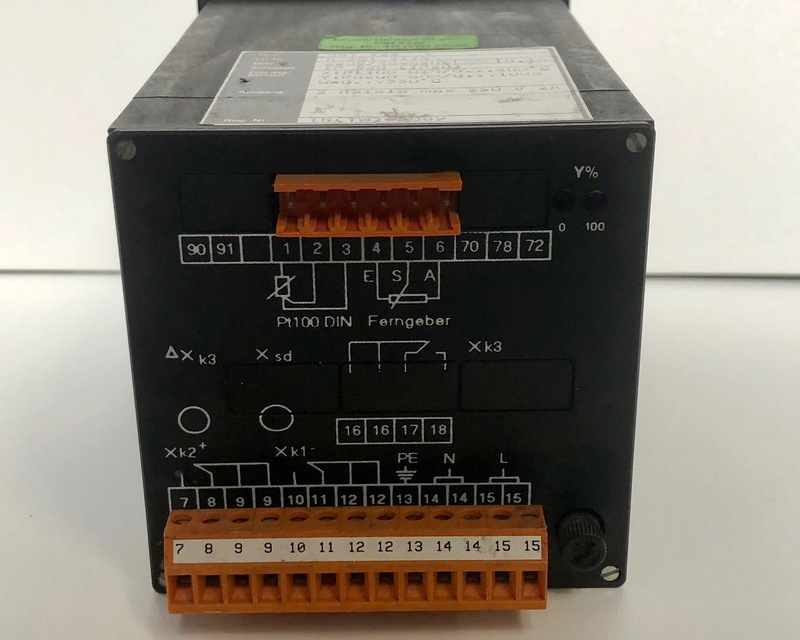 This electric controller offers a temperature (℃) display and various control switches and buttons to control the paramaters and set-points of the electric controller. 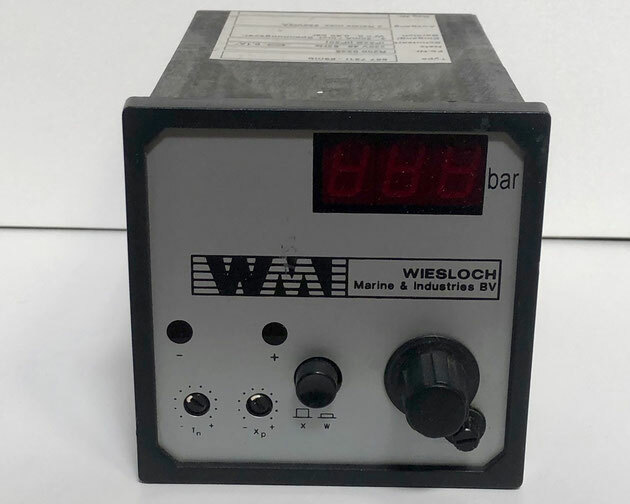 The Wiesloch electric controller, Type: 887721, Fb.Nr. : R9062502. This controller works on 230V/48/62Hz, T0,1A. The input is Pt100 DIN/0-400℃ and the W-input is 0…350℃. The output is 2 relais with max. 250V/2A. The front shows a 7-segment display for the temperature measurement and various buttons to adjust the parameters of the controller. 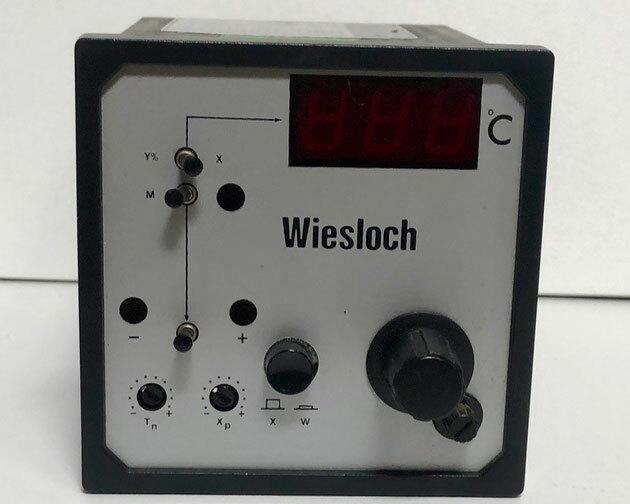 The Wiesloch electric controller, Type: 887721, Fb. Nr. : R9092235. This controller works on 230V 48…62Hz, 0,1 A. 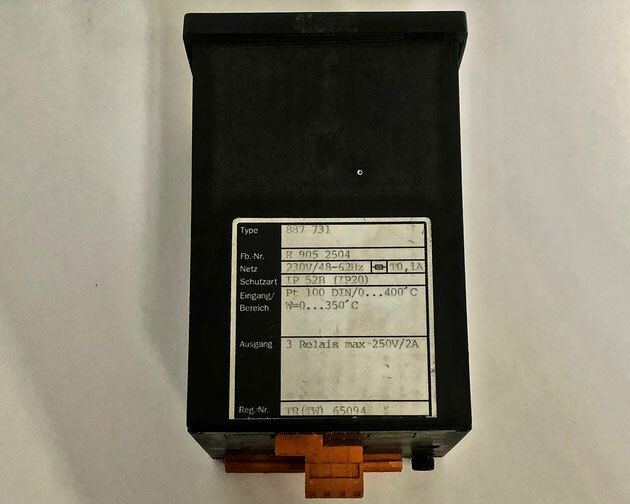 The input is 1 x Pt100 DIN/0-400℃ and the W-input is 0…350℃. The output is 2 relais with max. 250V/2A. 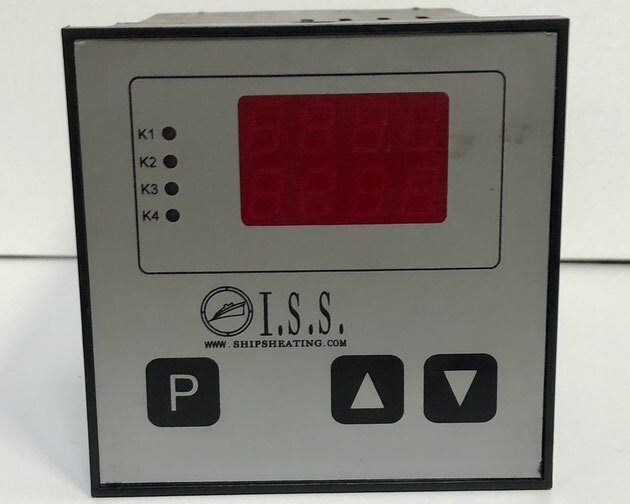 This electric controller has a display to show the temperature and various control buttons and switches to set the parameters and setpoints. 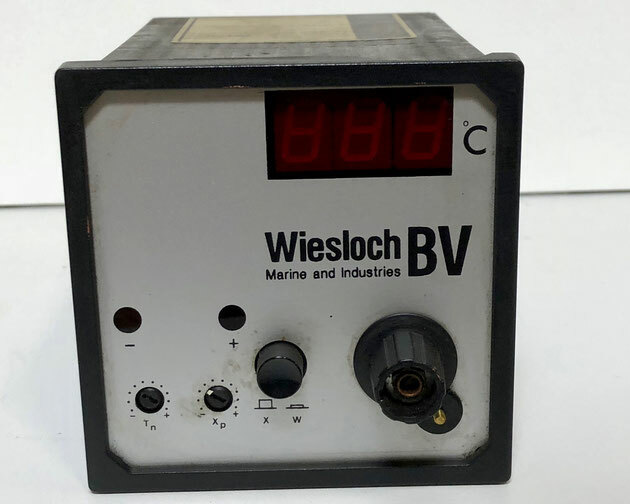 The Wiesloch electric controller, Type: 887721, Fb.Nr. : R9082820. 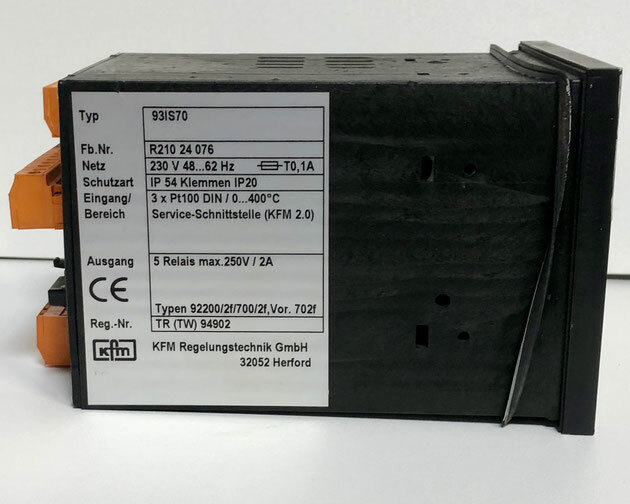 This electric controller works on 230V 48…62Hz, 1,0A. The input is 1x Pt100 DIN/0-400℃ and the W-input is 0…350℃. The output is 2 relays with max. 250V/2A. 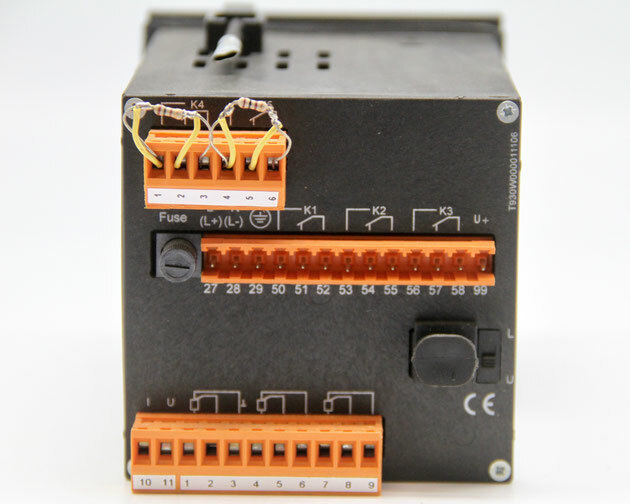 This electric controller features a temperature display and various buttons to change the parameters and setpoints. 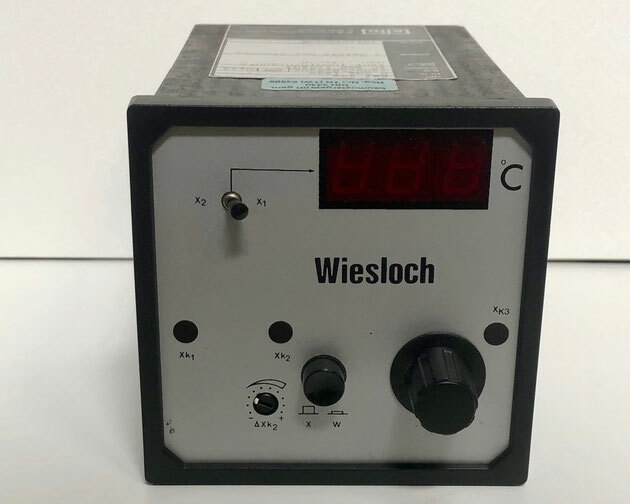 The Wiesloch electric controller, Type: 887721, Fb.Nr. : R9052722. 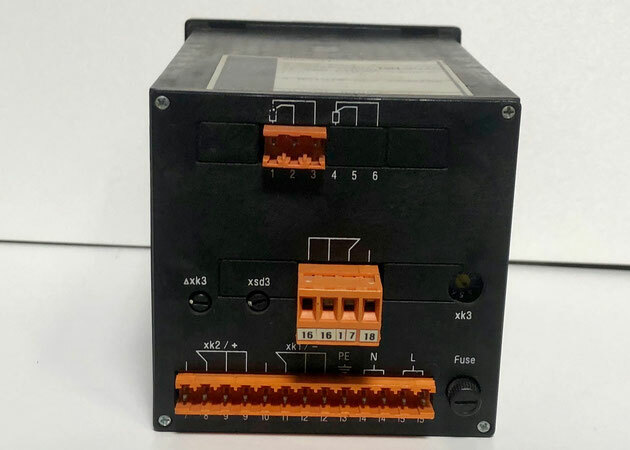 This electric controller works on 230V/48-62Hz, T0,1A. The input is Pt 100 DIN/0-400℃ and the W-input is 0…350℃. The output is 2 relais with max. 250V/2A. 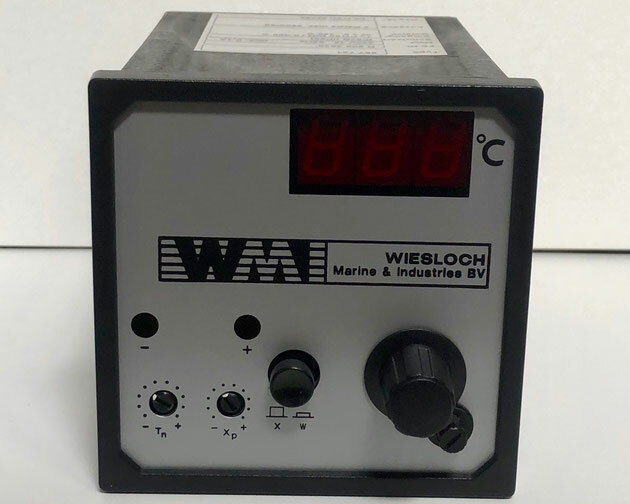 This electric controller features a display for the temperature in ℃ and various buttons to adjust the parameters and setpoints of the controller. 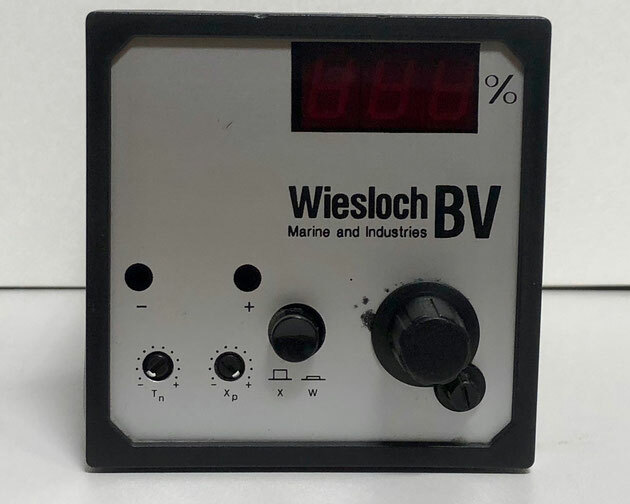 The Wiesloch electric controller, Type: 887732, Fb. Nr. : R9064739. 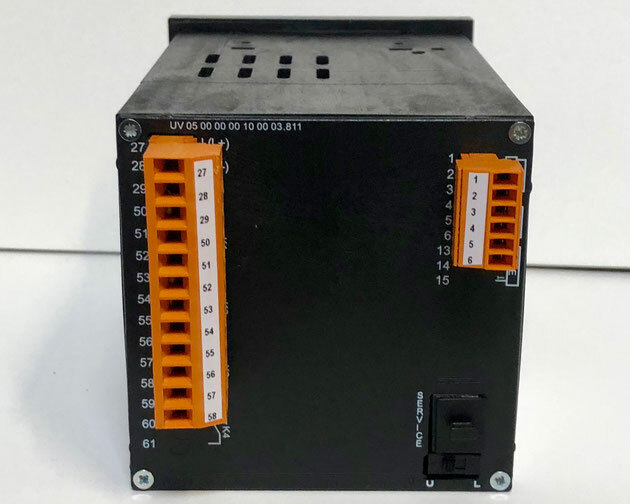 This electric controller works on 230V/48-62Hz, T0,1A. 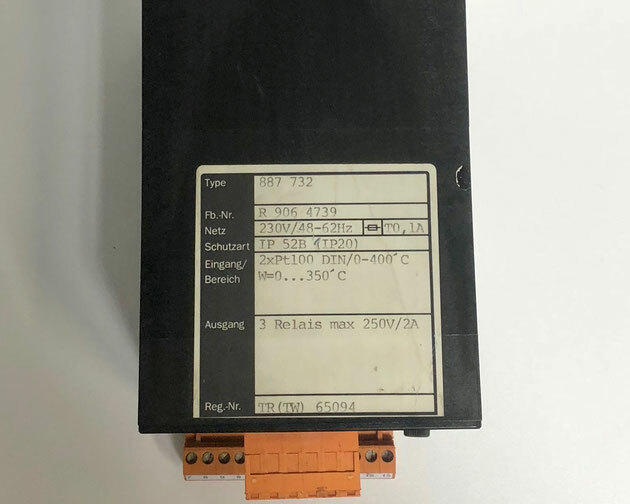 The input is 2x PT100 DIN/0-400℃ and W-input 0…350℃. The output is 3 relais with max. 250V/2A. 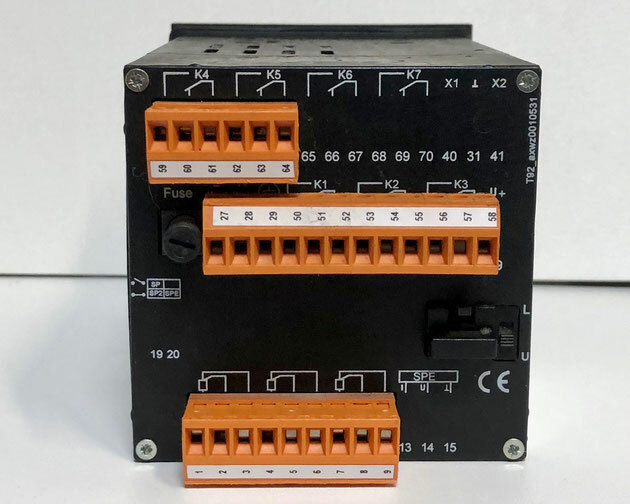 This electric controller has a display for the temperature and various switches and buttons to set the parameters and setpoints of the electric controller. 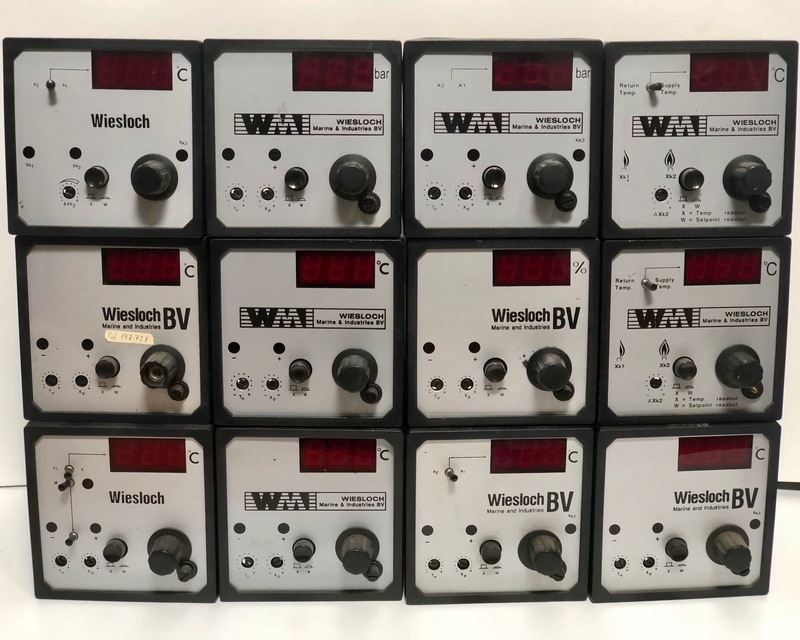 The Wiesloch electric controller, Type: 887721i, Fb. Nr. : R9063912. 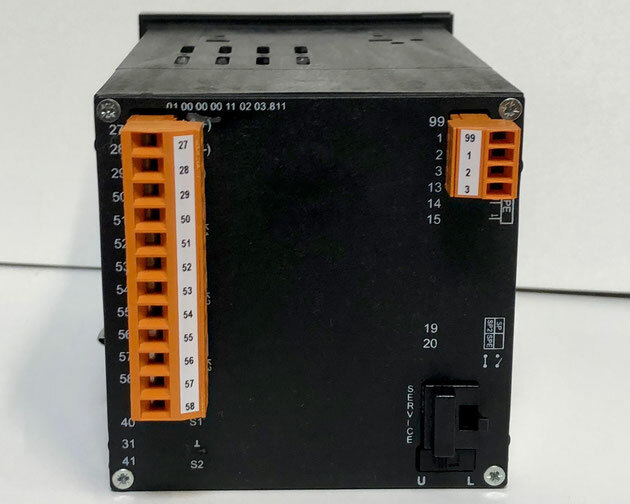 This electric controller works on 230V/48-62Hz, T0,1A. The input is 4…20mA 2 leiter, and the W-input is 0…99,9%. The output is 2 relax with max. 250V/2A. 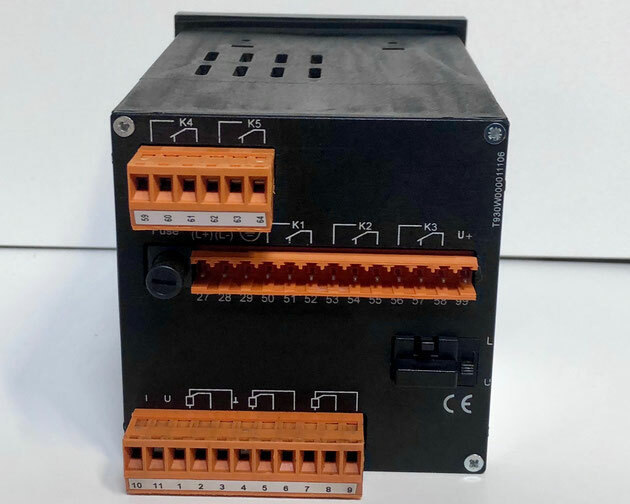 This controller offers a display that shows the percentage and various buttons to set the parameters and setpoints of the electric controller. 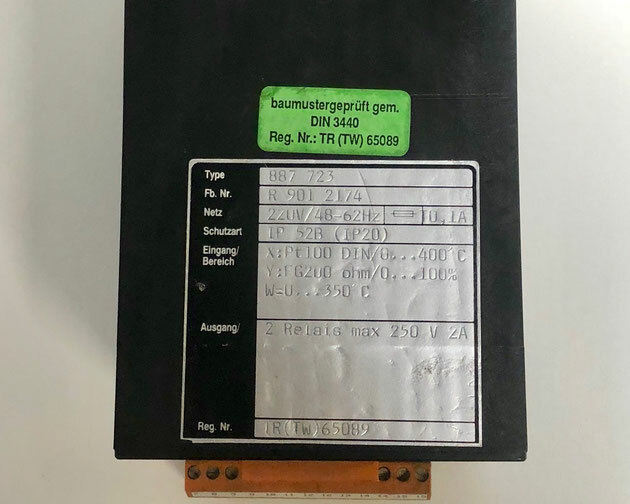 The Wiesloch electric controller, Type: 887731, Fb.Nr. : R9052504. 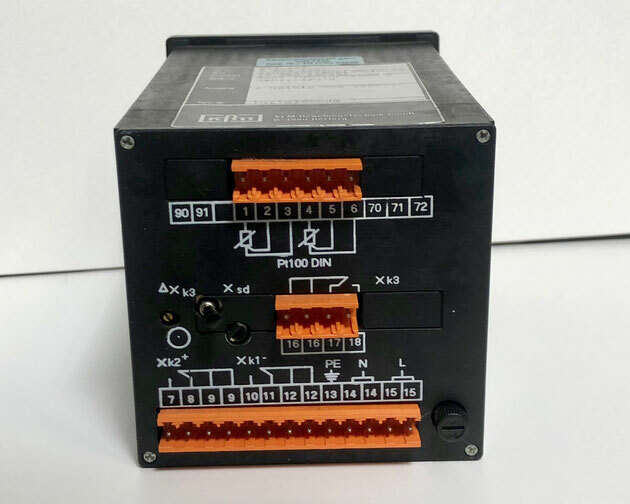 This electric controller works on 230V/48-62Hz, T0,1A. The input is Pt 100 DIN/0…400℃, and the W-input is 0…350℃. The output is 3 relais with max. 250V/2A. 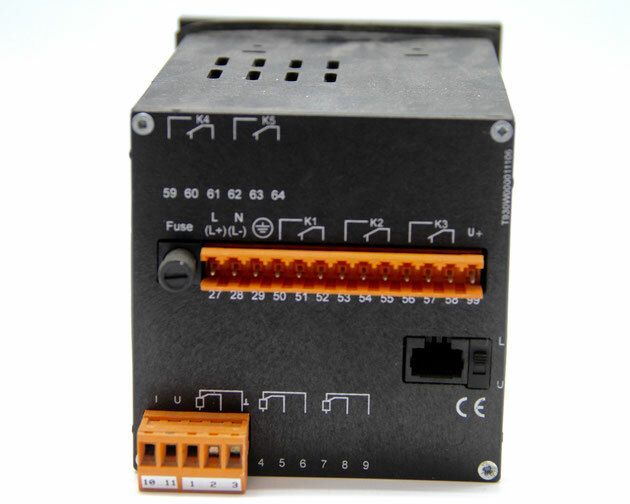 This electric controller has a temperature display and various buttons to set the parameters and setpoints. 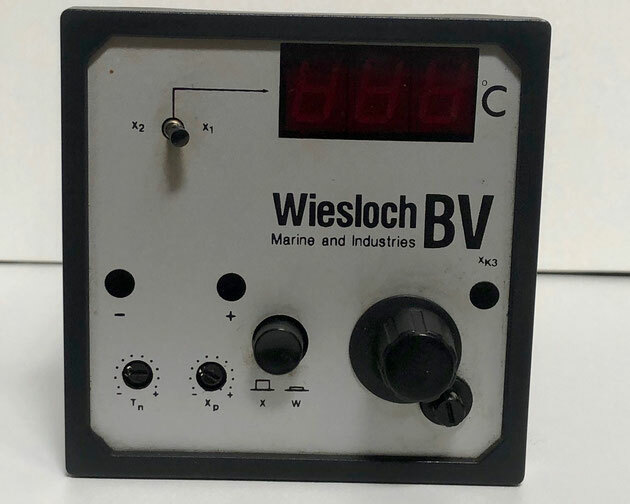 The Wiesloch electric controller, Type: 887222, Fb.Nr. : R908290. 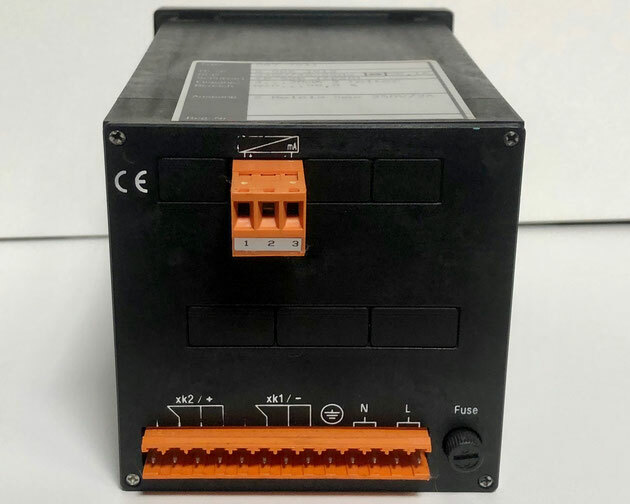 This electric controller works on 230V 48…62HZ, 0,1A. 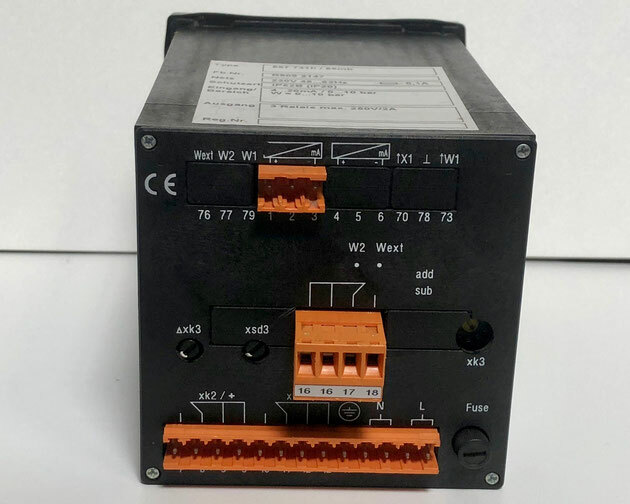 The input is 2x Pt100 DIN/0-400℃ and the W-input is 0…350℃. The output is 2 relais with max. 250V/2A. The display can show either the return temperature or the supply temperature in ℃. The setpoints and parameters of the controller can be adjusted using switches and buttons. 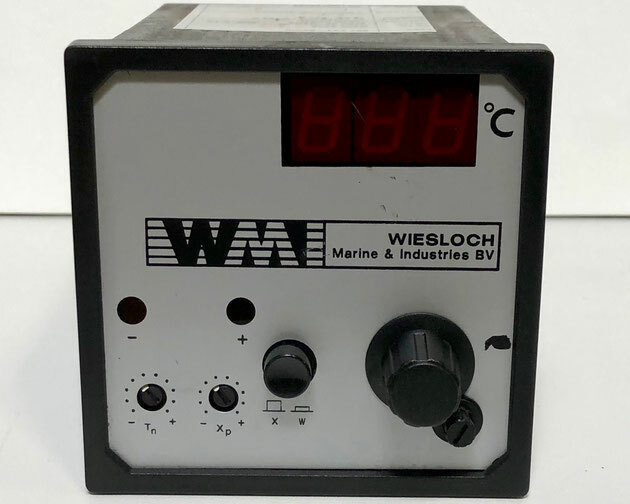 The Wiesloch electric controller, Type: 887731h/89mb, Fb.Nr. : R9092147. 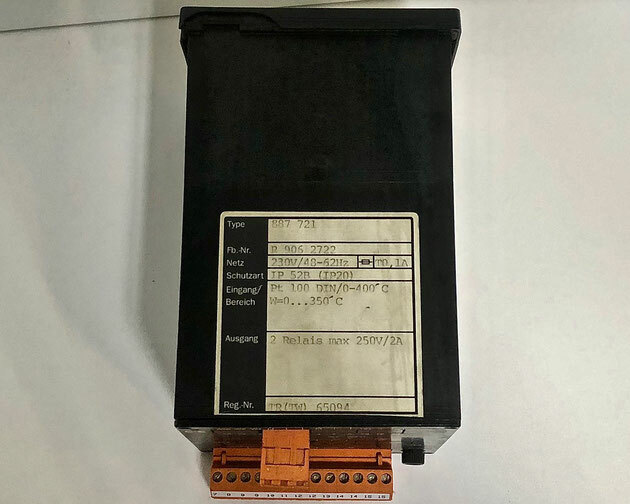 This electric controller works on 230V 48…62Hz, 0,1A. The input is 4…20mA/0…10bar and the W-input is 0…10bar. The output is 3 relais with max. 250V/2A. 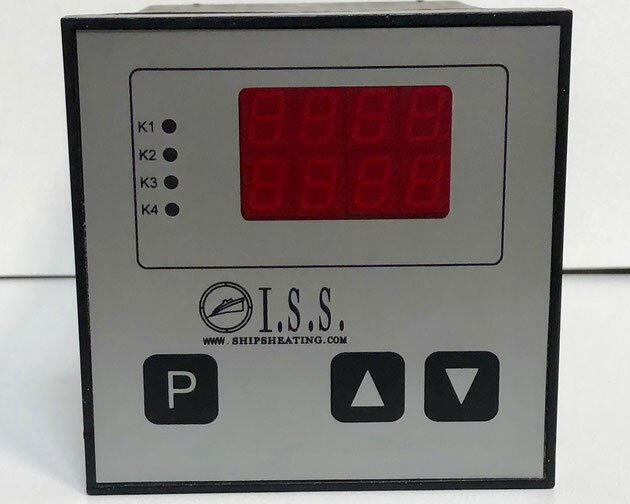 The display of the electric controller shows the pressure in bar and has various buttons to adjust the parameters and setpoints. 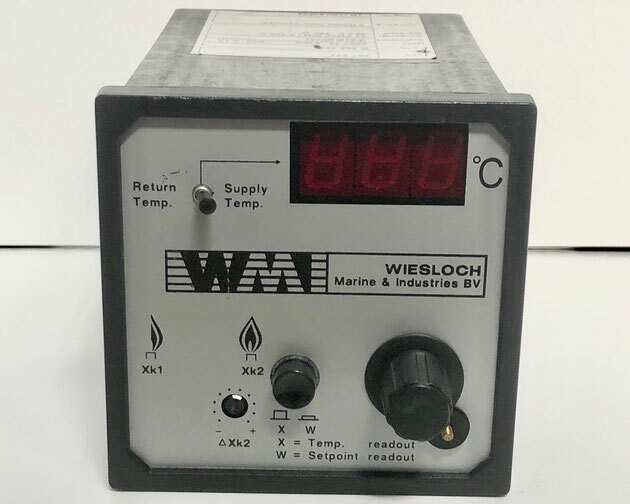 This is a minimum flow controller, used in thermal oil system of Wiesloch BV thermal fluid installations. 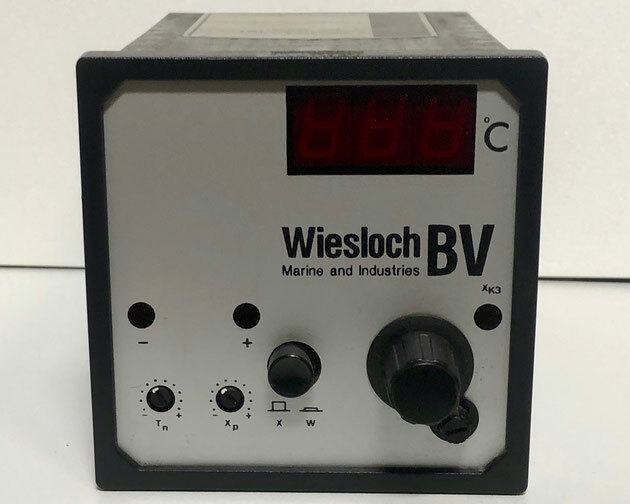 The Wiesloch electric controller, Type: 887242, Fb.Nr. : R9021544. 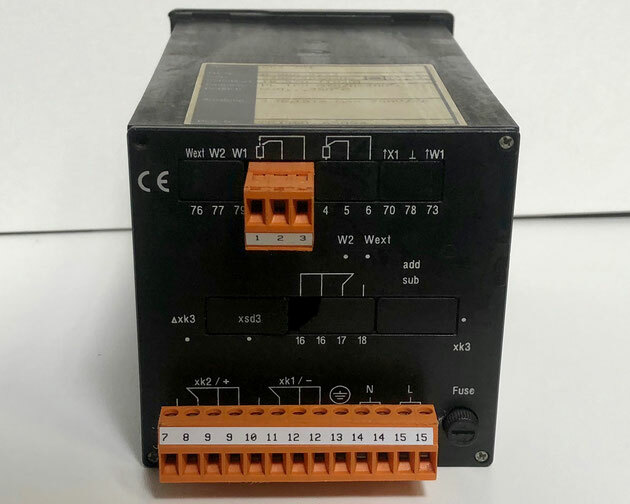 This electric controller works on 220V/r8-62Hz, 0,1A. 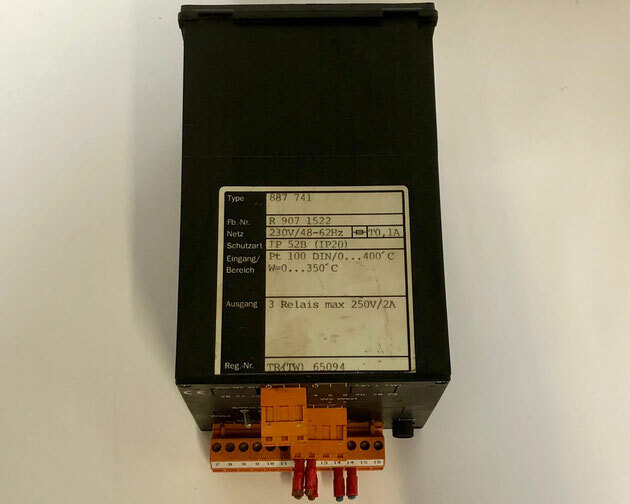 The input is 2x Pt100 DIN/0-400℃ and the W-input is 0…350℃. The output is 3 relais with max. 250V/2A. 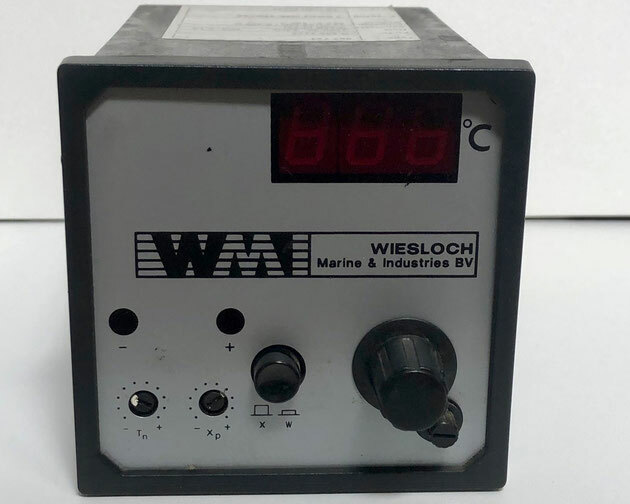 This electric controller has a display for the temperature in ℃ and various switches and buttons to adjust the parameters and setpoints. 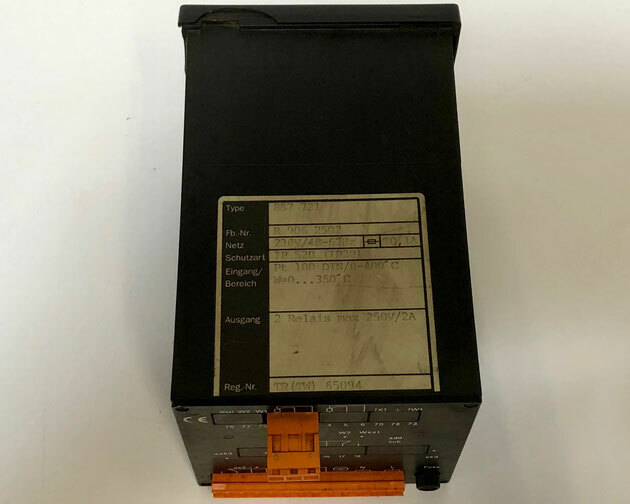 The Wiesloch electric controller, Type: 887721i-89mb, Fb.Nr. : R2000226. 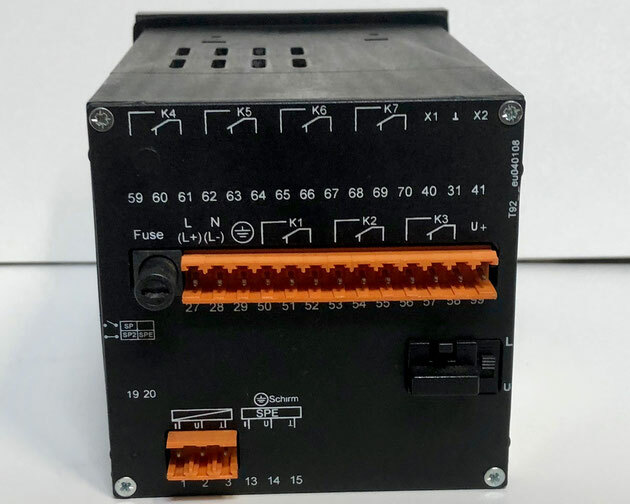 This electric controller works on 230V 48…62Hz, 0,1A. The input is 4…20mA/incl. Spannungsver. and the W-input is 0…0,60bar. The output is 2 relais with max. 250V/2A. 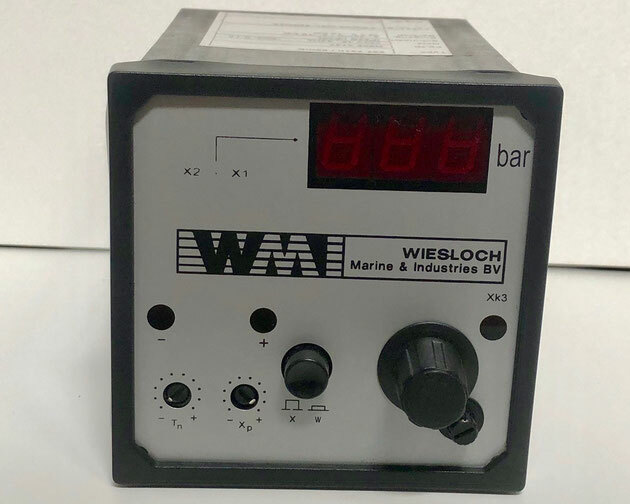 The electric controller shows the pressure in bar on the display on the front pannel and has various buttons to adjust the parameters and setpoints of the controller. 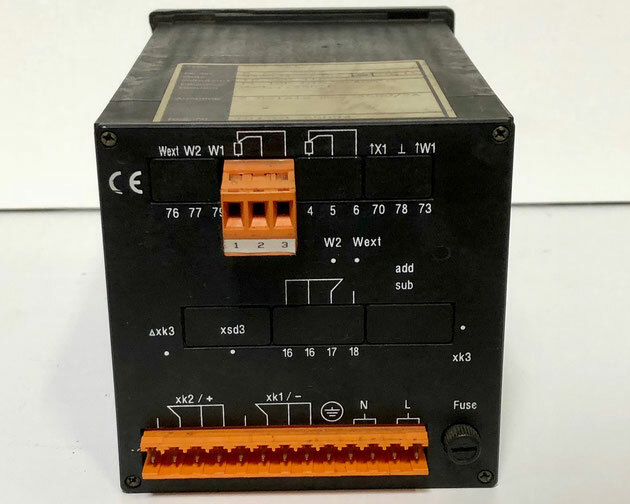 The Wiesloch electric controller, Type 887732, Fb.Nr. : R9073429. This electric controller works on 230V/48…62HZ, 0,1A. 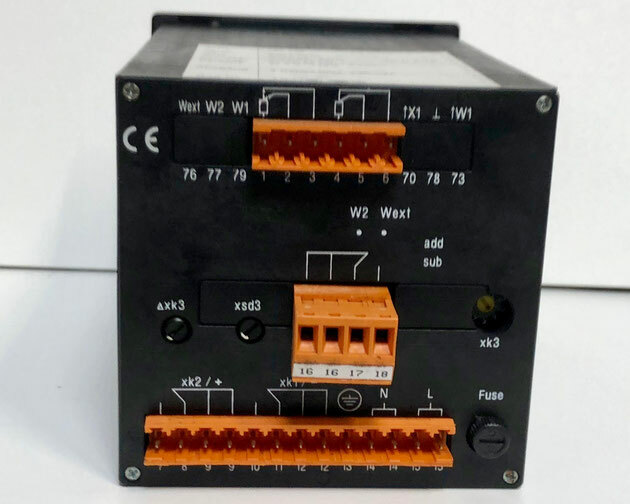 The input is 2x Pt100 DIN/0-400℃ and the W-input is 0…350℃. The output is 3 relais with max. 250V/2A. The display on the front of the controller shows the temperature and the buttons and switches can be used to set the parameters and setpoints of the controller. 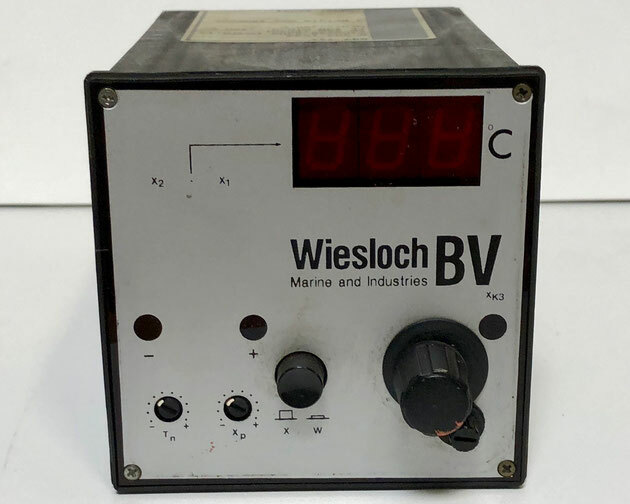 The Wiesloch Electric Controller, Type: 887721-89mb, Fb.Nr. : R2004038. This controller works on 230V 48…62Hz, 0,1A. The input is 1x Pt100 DIN/0-150℃ and the W-input is 0…150℃. The output is 2 relais with max. 250V/2A. The display shows a screen to show the temperature in ℃ and various buttons to adjust the parameters of the controller. 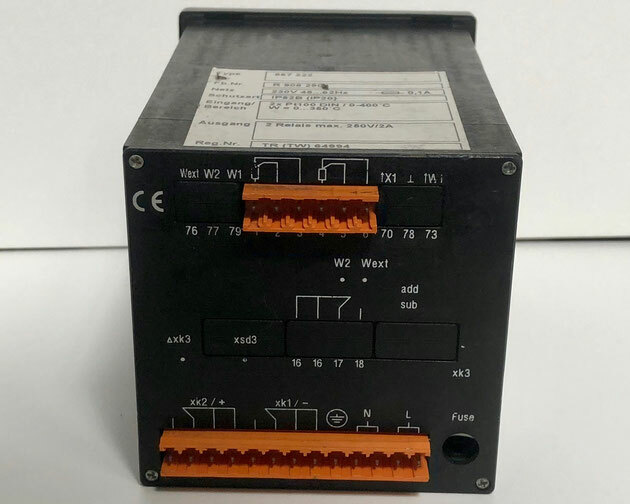 The Wiesloch electric controller, Type: 887741, Fb.Nr. : R9071522. The controller works on 230V/48-62Hz, T0,1A. The input is Pt100 DIN/0…400℃ and the W-input is 0…350℃. 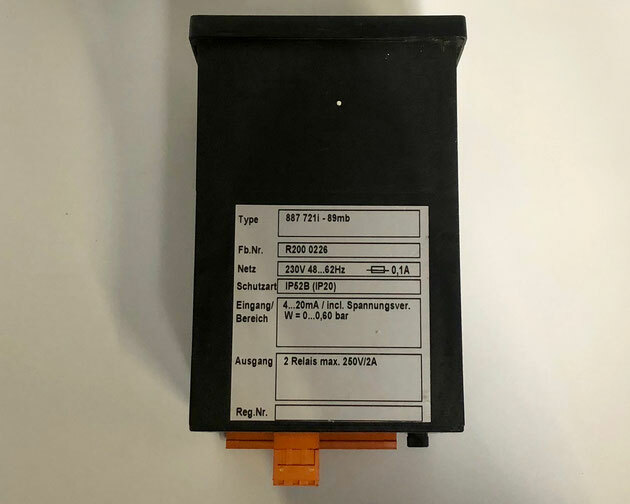 The output is 3 relais with max 250V/2A. The front shows a 7-segment display showing the temperature in ℃ and has various buttons to adjust the setpoints and parameters of the controller. 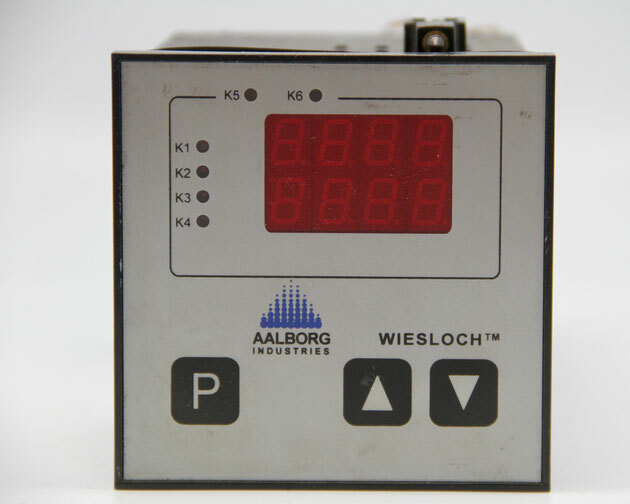 The Aalborg/Wiesloch electric controller, Type: 93W01700, Fb.Nr. : R20141053. 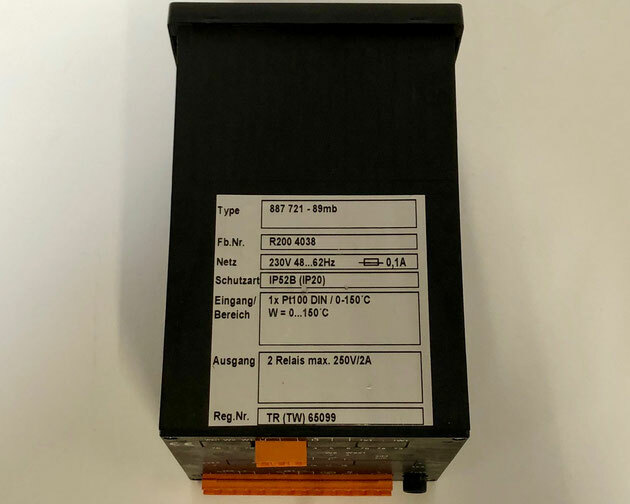 This electric controller works on 230V 48…62Hz and T0,1A. The input is 1x Pt100 DIN/0…400℃ and 1x 0-4…20mA; 0-2…10V/einst. Service Schnittstelle (KFM 2.0). The output is 2 relais with max. 250V/2A, U+ 18V with max. 40mA. 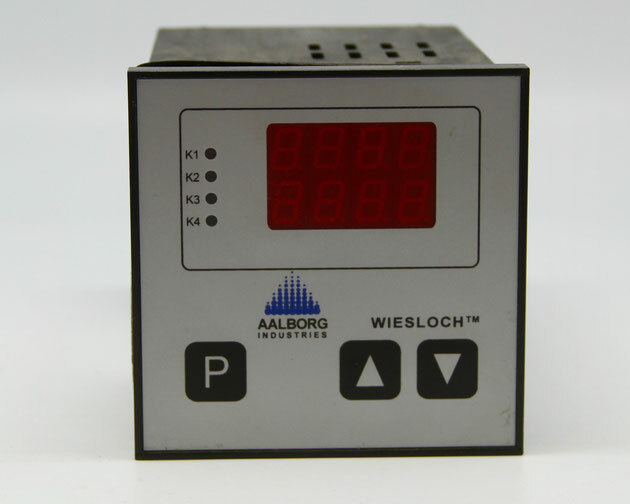 The Aalborg/Wiesloch electric controller, Type: 93W00200, Fb.Nr. : R2011426. This controller works on 230V 48…62HZ, T0,1A. 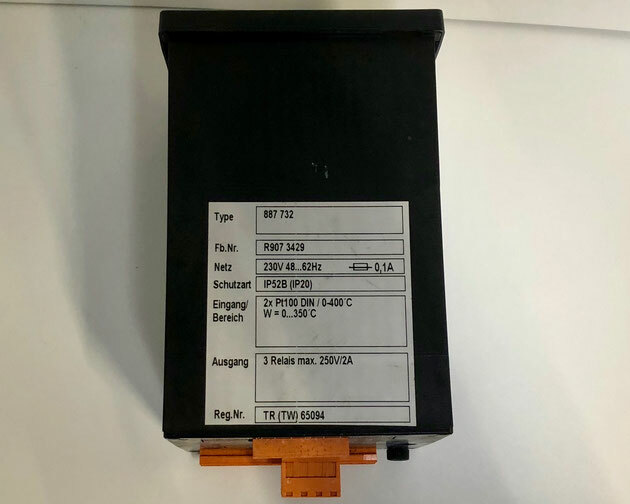 The input is 3x Pt100 DIN/0…400℃ and 1x 0-4…20mA; 0-2…10V/einst., Service-Schnittstelle (KFM 2.0). The output is 5 relais with max. 250V/2A, U+ is 18V with max. 40mA. 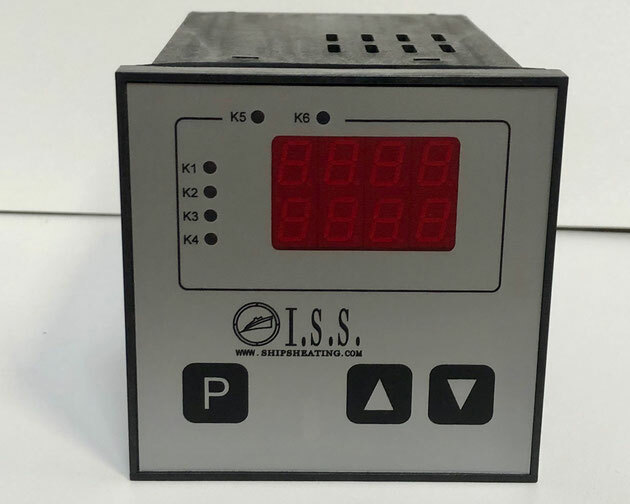 The I.S.S./KFM replacement electric controller, Type: 930i53, Fb.Nr. : R21810025. 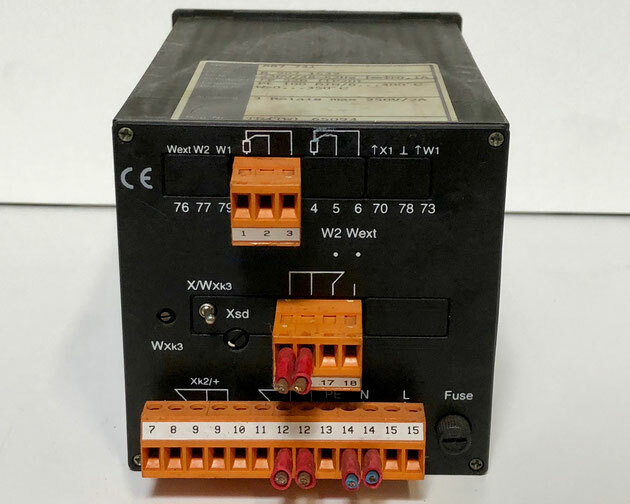 This electric controller can be used to replace old Wiesloch electric controllers. This controller works on 100-250V 48…62HZ, T0,5A. 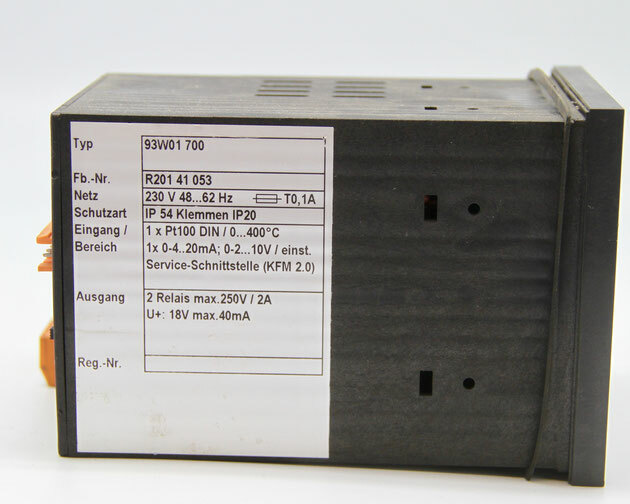 The input is 2x Pt100 DIN/0…400℃ Service-Schnittstelle (KFM 2.0). The output is 3 relais with max. 250V/2A. The I.S.S./KFM replacement electric controller, Type: 92701e, Fb.Nr. : R21124031. 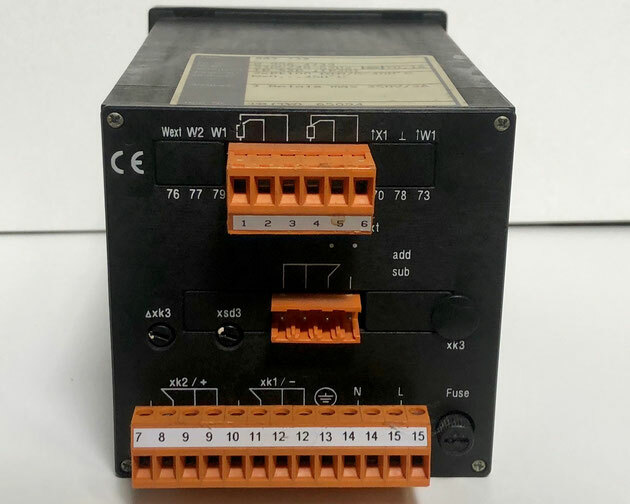 This electric controller can be used to replace old Wiesloch electric controllers. This controller works on 100-250V 48…62HZ, T0,5A. 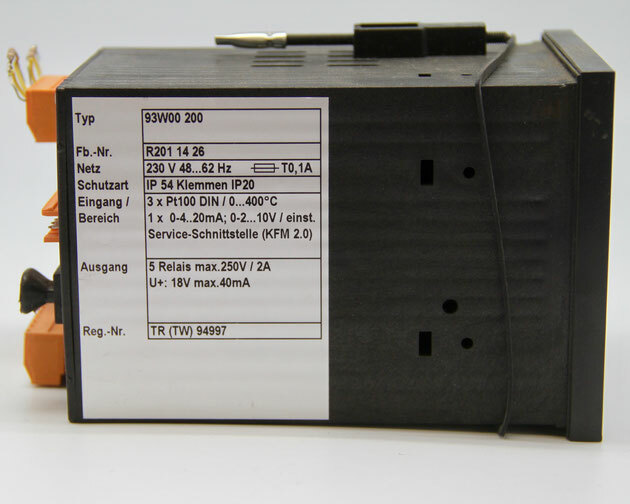 The input is 1x 0-4…20mA; 0-2…10V/einst, Service-Schnittstelle (KFM 2.0). The output is 3 relais with max 250V/2A, U+ 18V with max. 40mA. 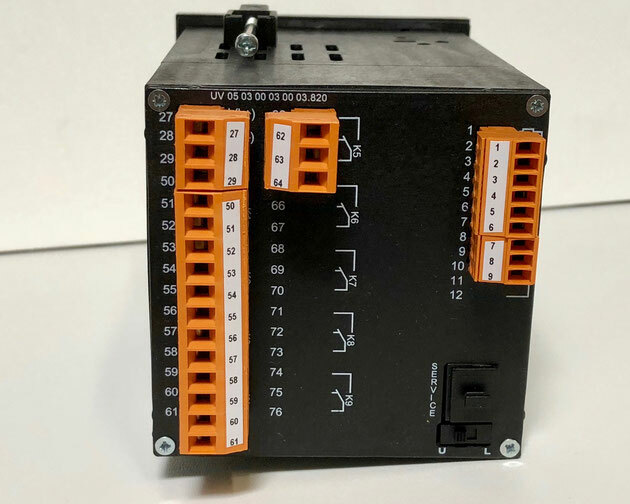 Their are two displays for the actual value available on this controller, it also has a LED display relay function and has keys to adjust the parameters and setpoints of the device. 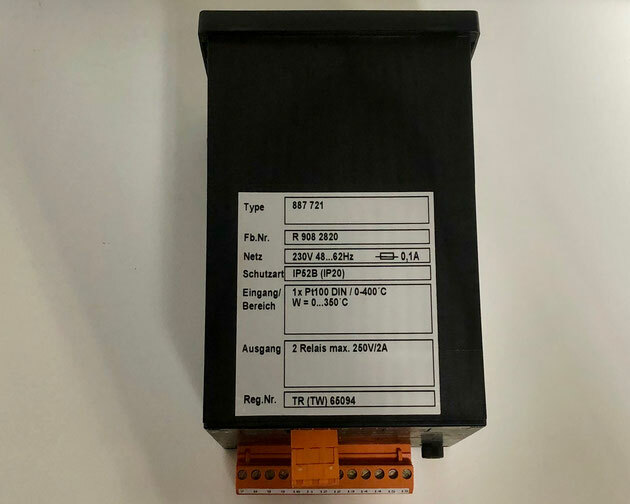 This type of electric controller is a three-point-step controller with with an an additional contact and a standard signal 0(4)…20mA,0(2)…10V. 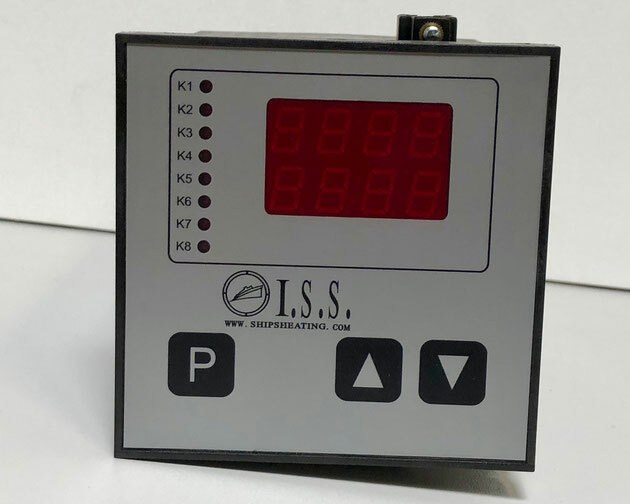 The I.S.S./KFM replacement electric controller, Type: 93W00701, Fb.Nr. : R2011439. 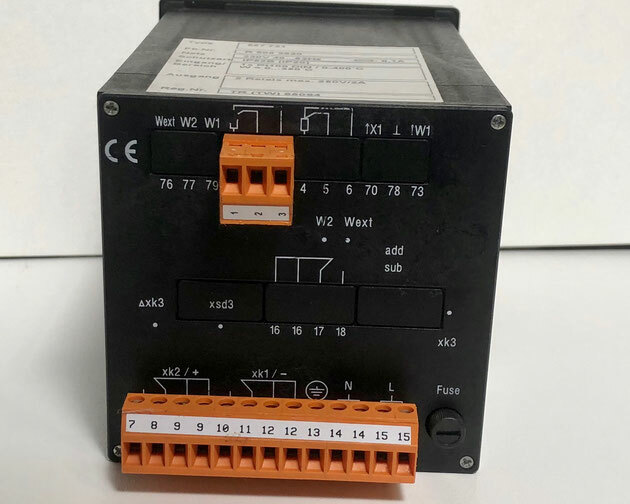 This electric controller can be used to replace old Wiesloch electric controllers. This controller works on 23V 48…62Hz, T0,1A. 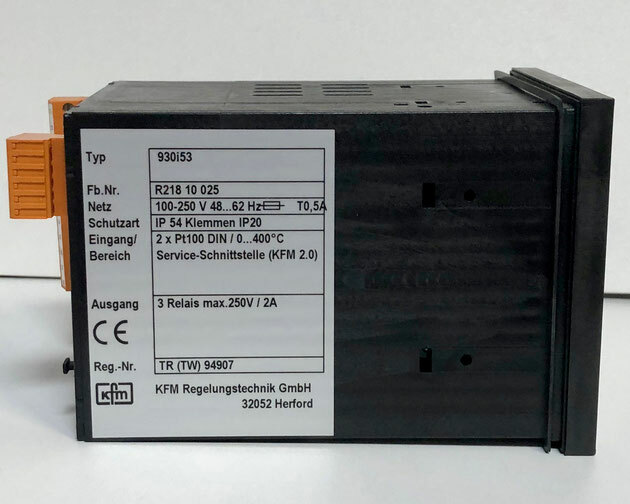 The input is 3x Pt100 DIN/0…400℃ and 1x 0-4…20mA; 0-2…10V/einst., Service-Schnittstelle (KFM 2.0). The output is 5 relais with max. 250V/2A, U+ 18V with max. 40mA. This controller has a feedback device 0…100 up to 1000 ohm. 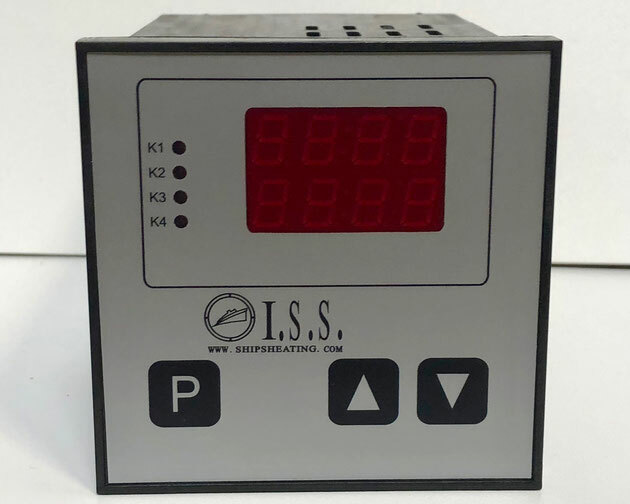 The I.S.S./KFM replacement electric controller, Type: 93IS70, Fb.Nr. : R21024076. 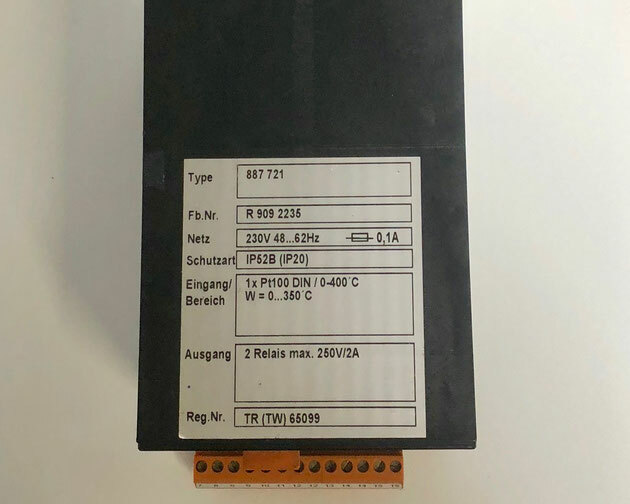 This electric controller can be used to replace old Wiesloch electric controllers who have Type: 887222 and Type: 887732. 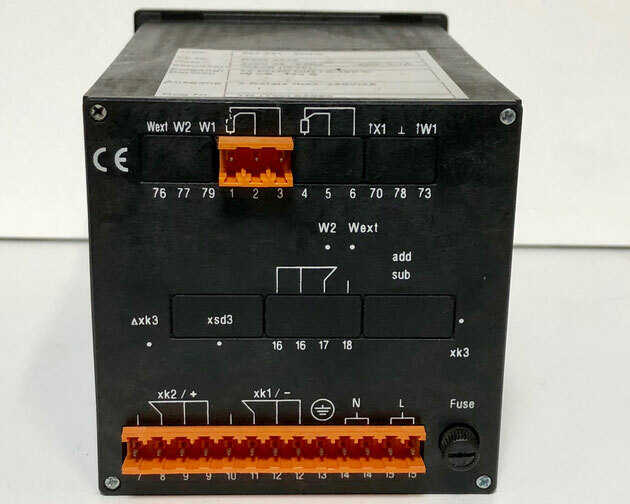 This electric controller works on 230V 48…62HZ, T0,1A. 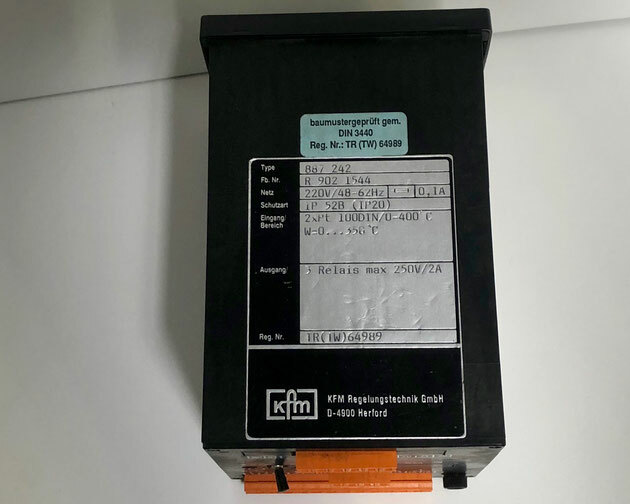 The input is 3x Pt100 DIN/0…400℃, Service-Schnittstelle (KFM 2.0). The output is 5 relais with max. 250V/2A. 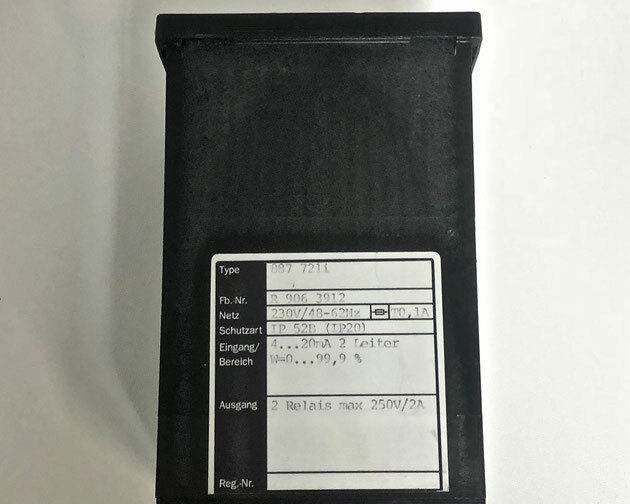 Typen 92200/2f/700/2f, Vor. 702f. 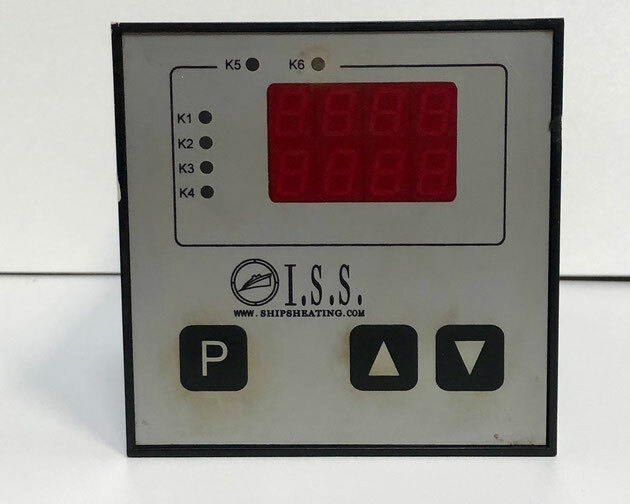 The I.S.S./KFM replacement electric controller, Type: 93is70, Fb.Nr. : R21810028. 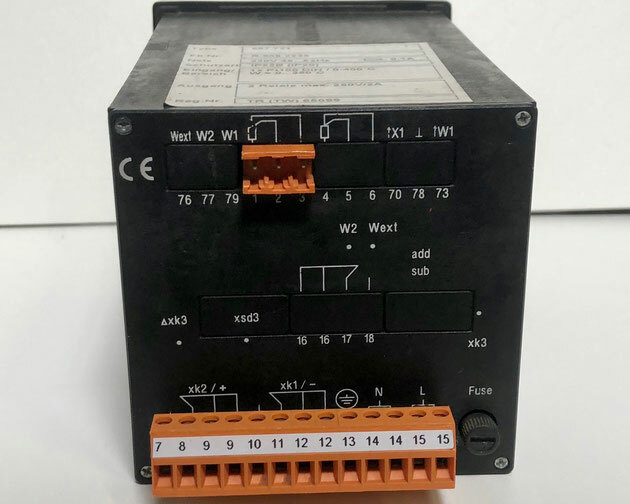 This electric controller can be used to replace old Wiesloch electric controllers. 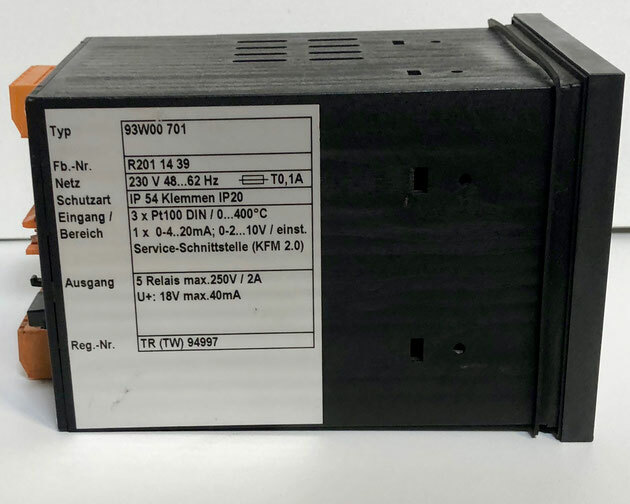 The controller works on 100-250V, 28…62 HZ, T0,5A. 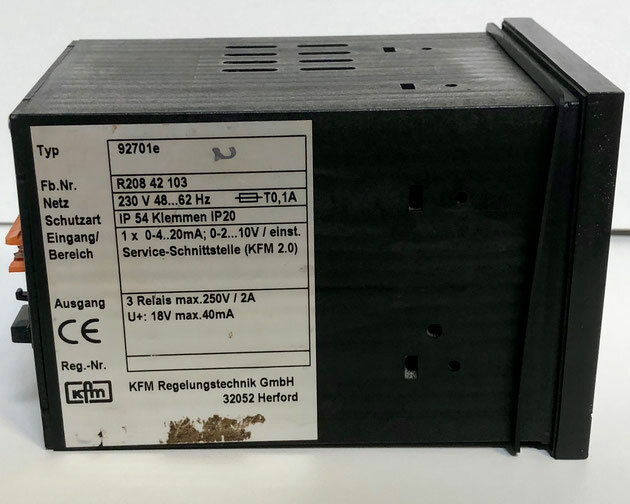 The input is 3 x Pt100 DIN/0…400℃, Service-Schnittstelle (KFM 2.0). The output is 5 relais with max. 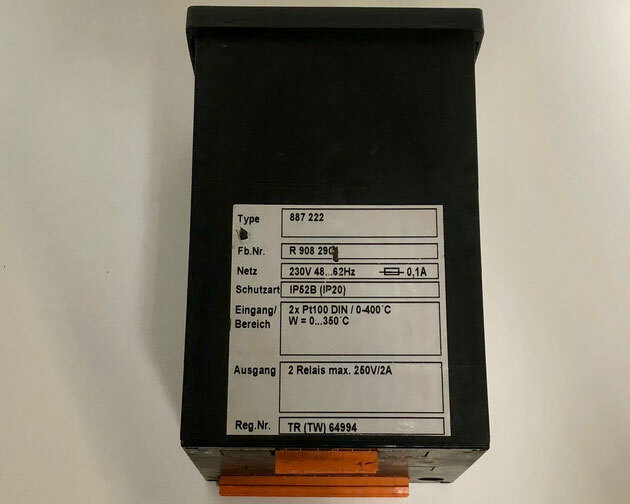 250V/2A, Type 92200/2f/400/2f, Vor. 702f. The display has two 7-segment displays and eight LEDs to indicate the status of the K's. The keys can be use to adjust the parameters of the display. 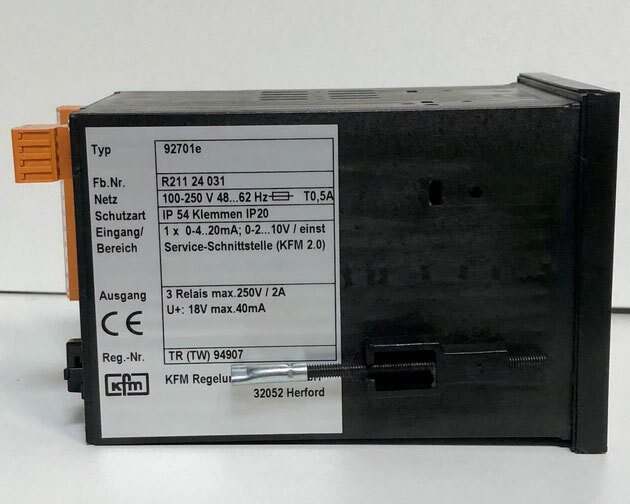 The I.S.S./KFM replacement electric controller, Type: 9270e, Fb.Nr. : R20842103. 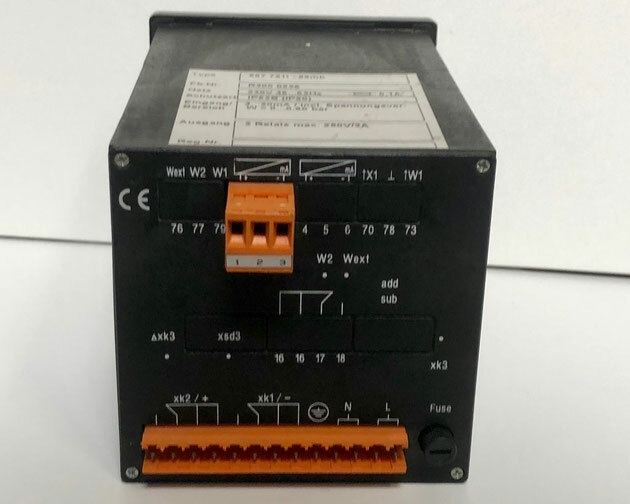 This electric controller is used to replace old Wiesloch electronic controllers. This controller works on 230V 48…62HZ, T0,1A. 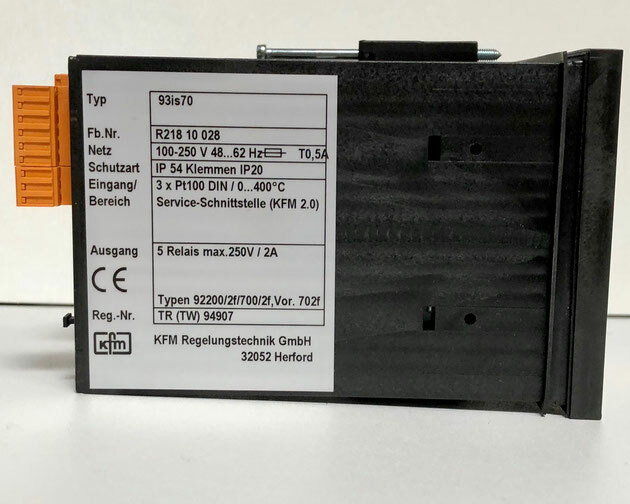 The input is 1x 0-4…20mA; 0-2…10V/einst., Service-Schnittstelle (KFM 2.0). The output is 3 relais with max. 250V/2A, U+ 18V with max. 40mA.